Can you believe that another year has passed us by? Wow! That went quickly! I do love a shiny new year, with all it’s potential and possibilities. I like seeing the months laid out and the calendar start to fill up with coffee dates, kids’ activities, conferences, and even project deadlines. I feel such expectant hope at all that God is going to do in 2018 and I can’t wait to get started. However, I still need to be mindful of the good work that God has already begun in me. 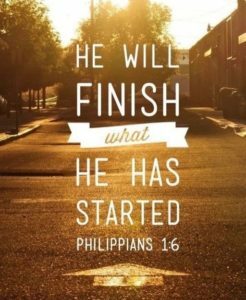 That simply means that God will be faithful to keep on developing us to our fullest potential in this coming year as well as the ones that follow, if we let Him. Even if we didn’t realize all our goals in 2017, we can rest assured that there is grace for 2018 and move forward with confidence knowing that God will keep working in us. We’ve got to do our part to keep on shining in this new year. And as we reflect the light of Christ then others will see the good work that is in us and they will give glory to the very one who started it in us – God the Father. Isn’t that beautiful? This year let’s resolve to be lights that shine brightly and then let’s keep on pointing others to one who started it all: our faithful God.